BASRA, Oct 12 2011 (IPS) - “Before being deployed to Iraq I never thought I’d come across people who physically resemble my friends and family back in Buffalo,” says U.S. marines sergeant William Collins on a rare patrol around Basra’s Zubeir district. In Basra’s Zubeir district. Credit: Karlos Zurutuza/IPS. The American marine arrived four months ago in Iraq’s second largest city. Collins admits that nobody in his battalion knew of the existence of an Afro-Arab community in Iraq, not even the Afro-Americans like him. “If I dressed the local Arab garb, I would be able to walk across these streets and nobody would take me as a foreigner,” says Collins. He adds that he’d probably feel safer that way than with the bulletproof jacket and the helmet he’s wearing. There are many black people in Basra and especially in Zubeir district – an area of crumbling mud-brick buildings that is home to 300,000. Most black people in Zubeir claim to be descendants of slaves brought to the Gulf from Africa at least since the ninth century. And some old habits seem to have survived for a whole millennium. 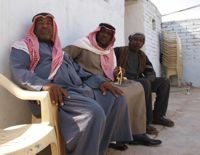 “The Arabs still call us “abd” (“slave” in Arabic), says 46-year-old Zubeir resident Amin Tarik. “Luckily enough, there are not aggressions against us, but we face discrimination in almost every aspect of life,” adds Tarik, speaking in the courtyard of his humble mud house. Iraqi blacks hardly speak any language but Arabic, and they are overwhelmingly Muslim, like the majority in the country. Slavery was abolished here in the 19th century but the colour of their skin literally closes many doors. In Basra's Zubeir district. Credit: Karlos Zurutuza/IPS. It’s almost impossible to spot mixed couples on the streets of Basra. Women who marry a black man – it’s never the other way round – have to walk under the eyes of Iraqi tribal society. While many call the Afro-Arabs “abd”, they still call the local Arabs “free men”. Among the latter, there are all sorts of views on discrimination. “The black people have always been fully integrated in our community,” says resident Said Al Mehdi. “Even my grandfather’s fourth wife was a black woman. I’d always kiss her hand with great devotion,” recalls this 72-year-old man, hair covered with a green scarf to suggest he’s a direct descendant of Prophet Muhammad. Not everybody would agree. “These people have been facing discrimination since the very day their ancestors were brought from Africa to build canals and to turn marshlands into fields for cotton and other crops,” says Saad Salloum, editor of Masarat, a magazine focused on the minorities issue in Iraq. But they have found a political voice to speak for them. “We celebrated Obama’s victory in the streets as ours in 2009, and it really encouraged us to fight for our rights,” says Salah Ruhais Salman, vice-president of the Iraqi Freedom Movement, a political party established to defend the rights of Iraqis of African descent. Salman says Iraqi blacks have been forced to keep a low profile since the invasion of the country in 2003. But now they are asking for recognition as a national minority, something that would grant them a seat quota in Parliament. But the unpaved road ahead seems to be endless, going by the eloquent figures provided by the 50-year- old activist. “There are around 1.5 million of us in Iraq but none of us occupies any position in the Iraqi administration. I ran for the local elections back in 2009 with seven other colleagues. Despite Basra hosting Iraq’s most significant black community, none of us was elected. Can you believe that?” Salman has no doubts that the vote was “blatantly rigged”. Many Iraqi blacks make a living as musicians. A wedding in Basra is never complete without drummers called in from Zubeir district. Wafa Majid volunteers there as director of the women affairs section at the community meeting centre. The place was established at the beginning of this year and today it hosts computing and sewing workshops, as well as a reading and writing centre in order to tackle the high illiteracy rate – well over 90 percent among the local black women, according to local NGOs. “It’s not easy to be black and a female in Iraq but we cannot just sit down and watch our husbands play bongos,” says Majid. Behind her, a group of 20 women sitting in front of a set of computers prepare for the massive challenges ahead. We black went by BLOOD of our FATHERS and LAND of our FATHERS. It was for forbidden to mingle the blood. But Sons of God(Blacks) began marrying Daughters of Men(Heathen)(whites) Whites are not Original to Any Land Mass. White historians say that they were forbidden to say that Nubian were Presidents of the PLANET. They say that they use words like mediterranean to hide that the people of that LAND were ORIGINALLY BLACK. We are the Original to Each Land. They are able to Lie and tell the black people of the world that we are All African, because during slavery we weren’t aloud to teach. And names stollen! their white mix people Run Each Land in our Name As Us. Soon the white mix will be white. He hates the ORIGINAL all over the world. “There was a war in Heaven” The Lessor God wanted to be like The High God. We were the Perfect children of the High God. the Lessor Gods Children were Not perfec and were dying out. Sons were to weak to survive child birth. If he did he’d be weak, sickly and hunch back. Until we began marrying them. Now They Are Like Us. Whatever they put in their mind to do they can! Because of the mix! GREEKS celebrated the union because it meant a stronger Healthier seed. So we helped our hater outlive his Experation. Because of ignorance you continue marrying you curse.